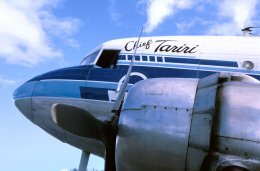 Nowhere else are flying conditions as marvelous as they are on the Bahamas! The sky - as free as you can imagine. Over 700 islands! Nearly every day excellent weather to fly over the wonderfull colors of the envirometly healthy archipelago of the bahamas; in the middle of unspoiled nature with it's typical happy kindness. 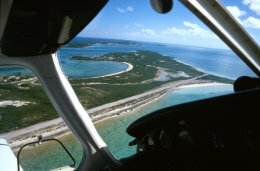 20 islands provide approximatly 40 legal airfields. The islands attractions are in each case in the immediate vicinity: beaches, settlements, hotels, historical sights, animal world, etc.Nearly all airfields are equipped with an Unicom(frequency 122.8 for other frequencies see Pilot´s Guide).about one third of those have a Port of Entry status. A few got an "Advisory Traffic service"/NDB/VOR. Good sight allows simple navigation. At the briefing you get valuable hints. The Pilot´s Guide all planes are equipped with is a must. 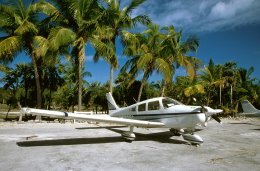 For flights in the USA and the Bahamas you need a US-licence and a transfer is necessary. Adress: 1150 Lee Wagener Blvd. #201, Ft. Lauderdale Fl 33315, USA, Businesstime: Tuesday, Wednesday, Thursday from 0800 to 1600. Phone: 954-359-7526. Bring along: pilot´s licence, flight medical and passport. The transfer is free but you have to make an appointment. Price is $70 in the USA. Additionally the settlement of accounts follows the "Hobbsmeterdisplay" plus $25 for the Check-out Pilot. In case of carrying out in STELLA MARIS: Flightprice follows "Hobbsmeterdisplay", Check-out free. - Turks & Caicos Islands and South-East Florida after arrangement. The STELLA MARIS Resort Club and it´s Ft. Lauderdale-Office will help the STELLA MARIS-flighttourist all time and in EVERY case (you don´t have to feel uncomfortable about the Check-out and other Formalities... where Help is necessary, you will get it quick!). The STELLA MARIS-enterprise have experienced Florida/Bahamas - pilots at their disposal. They help every pilot with active assistance and hints. Port of Entry: NDB 526 AV-GAS ca. $3.30/Gal. Transfer (ca. 1 Mile to Hotel) Taxi $2.50 Person / Way. ca. 10-minutes on foot.